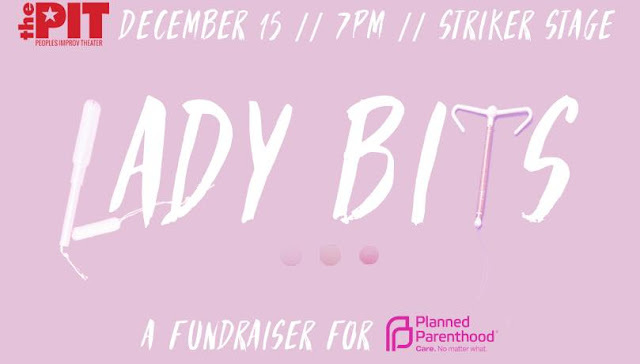 In the latest blog hijack, Kerry Ipema tells you about Lady Bits, a one-night only fundraiser for Planned Parenthood at The Pit! LADY BITS playing Tuesday, December 15 at 7:00 at The PIT. Every ticket bought is a donation to Planned Parenthood. Here's a blurb about the show! New York's finest ladies talking about Lady Bits. A response to the many attempts to defund Planned Parenthood and the stigma of talking about reproductive health. Come hear stories, songs, stand up, and music all about some of our favorite body parts! All profits will go directly to Planned Parenthood. And Graphic Design by Ellie Philips!